Nokia has recently announced its Nokia 6760 Slide. The slider phone with QWERTY keypad has been optimized for messaging. The phone has been enhanced for easy access to favorite social networking sites such as Facebook, Myspace, Twitter as well as email accounts from Ovi mail, Gmail, Yahoo!Mail, Windows Live Hotmail and etc. 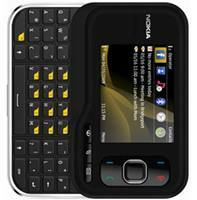 Along with a 2.4-inch QVGA display, Nokia 6760 is also equipped with a 3.2-megapixel camera, supports WCDMA 900/2100 HSDPA, integrated A-GPS with Nokia Maps 3.0 and Bluetooth enabled. In addition, it supports Push email and comes with MP3 player. The Nokia 6760 slider phone will be available in the third quarter of this year.